The Midnight Review: WFTV Gets The Facts Wrong About Sand Lake Hills HOA Lawsuit! WFTV Gets The Facts Wrong About Sand Lake Hills HOA Lawsuit! The homeowners association was claiming to be the ruling authority over the surrounding subdivisions that shared a common name (Sand Lake Hills) and a few years the association rewrote the covenants and restrictions to give them limitless power, such as collecting any amount of money they want from every homeowner (not just the membership) at any time the board chooses, without homeowner approval. There were also several other things the association did wrong, like violate their articles of incorporation, ignore the original covenants and restrictions, lie and misuse a county grant, illegally utilize software licensed under defense contractor Lockheed Martin, and improperly notarize hundreds of joinder and consent forms approving their rule changes. As I had reported on March 24th, a ruling by a judge determined the HOA was illegal, acting without authority. Now that you are caught up, I wanted to point to a local news story from WFTV Channel 9, in which the report gets some facts wrong and makes the same mistakes the homeownership had made over the past few years while the association was being sued. An Orange County homeowner is taking on his neighbors. Jeff Busch is suing his entire neighborhood over an alleged illegal homeowner's association. There really is no reason to question the legality of the association in question. According to the ruling, the association had no authority to enforce the covenants and restrictions. The judge continues that even if the plaintiff was a member at the time the association filed their claims to the surrounding subdivisions, they improperly filed documents with the courts, only notifying membership, not the every affected property owner. "I was right, they were wrong," Busch said. Busch said his neighbors were trying to force him to pay HOA dues against his will. So he's now suing 90 people in the Sand Lake Hills community off of Dr. Phillips Boulevard. The author of this article should get their facts straight. Above they state the Busch is suing 90 people but in the next paragraph, they state "99 homeowners." Also, Busch is correct - since the HOA was deemed to not be the legal HOA over Busch's property, and being that the 99 individual homeowners signed documents granting the Sand Lake Hills association authority over every property, they were in effect liable. Busch put a sign on his garage stating he should have property rights and there should not be an HOA. He's been fighting with the Sand Lake Hills homeowners association since 2008. He sued the HOA and 99 homeowners because he claims the HOA was formed illegally. Again, as the judge recently ruled, the HOA was formed illegally. Each homeowner is supposed to agree to form an HOA, but he says that did not happen. During the hearing in front of the judge, the association's lawyer, Frank A. Ruggieri from the most awesome law firm in Orlando, Larsen and Associates, admitted that the HOA had zero records showing each homeowner agreed to form an association, so it is not a matter of what Busch says, rather, it is a matter of fact. "This is property rights. How can they come on my property and assess me for anything they want?" The homes were built more than 30 years ago, and in the past, the HOA was voluntary. Homeowners donated money to the association to maintain common areas. Again, during the legal proceedings, the association's attorney admitted that there were no "common areas." 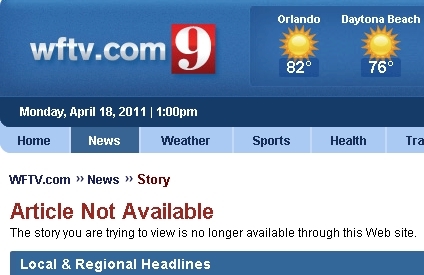 The location showed in WFTV's report is actually maintained by a county tax, not the HOA. The donated money the HOA collected went towards a police patrol of the neighborhood, legal fees, printing and postage of a newsletter, and in recent years, water and electrical bills for the associations pet projects. Even the wall the HOA claims credit for was built using a Municipal Service Benefit Unit - an assessment levied by the county and added onto the yearly tax bill of every homeowner. Jerry Rarden supports a mandatory association and says its only costs $100 a year. Jerry Rarden, presumably another resident of Sand Lake Hills, seems to have fallen for the false narrative set up by the HOA. No where is the $100 cost set in stone. According to the Amended and Restated Covenants and Restrictions and By-Laws, which have since been removed from the association's website, assessments "can be increased or decreased from time to time pursuant to the approval of a majority of Directors of the Board of Directors." Again, nowhere is the $100 figure ever mentioned. This is something the HOA has been telling the neighborhood for years. "I think it's a frivolous lawsuit," said Rarden. Busch says that's not the point, and a judge recently agreed. The neighborhood was built in sections and she said Section 2 HOA was not authorized to enforce use restrictions in Section 3 after 1985. This sentence pretty much discredits the entire article. The author of this piece talks about allegations and accusations but in the above sentence they actually state a 100 percent true fact - the judged ruled against the HOA and stated the HOA "was not authorized to enforce use restrictions in Section 3 after 1985." Busch claims the title of his property is also muddied. He's says the HOA is not allowed to put a lien on his property, but he also has to fight it out in court. An HOA board member says a judge dismissed the suit against the individual homeowners, but Busch says he intends to sue all of his neighbors for his legal bills. He says he has spent hundreds of thousands of dollars. The dismissed suit the anonymous board member referenced was a pre-trial decision, and the judge made the ruling because the HOA's attorney delayed dissemination of the necessary information. "[Evidence] was not available to us when we went before the judge because it was delayed by the HOA attorneys even though it was ordered to be given to us by the courts," wrote Busch on his website. "When the HOA attorneys went before the judge to have you dismissed from the case they conveniently didn't mention it." 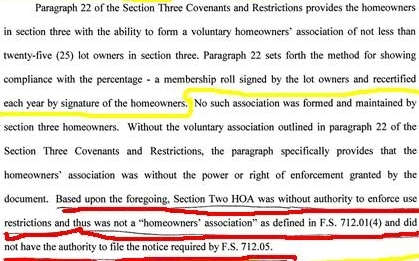 The evidence he refers to are excerpts from the judge's ruling, where he dismisses the complaint against the homeowners because they were simply signing a consent form from the association, which is contrary to meeting minutes where the board of directors claim the changes are not an "association amendment," but an "owner amendment," meaning the association is claiming the homeowners are the ones liable for the changes. Also, just three days ago, they updated their website claiming they are "still alive" and that the ruling (the one above mentioned ruling that stated they lacked any authority to act as the HOA over the other sections) "was specific to one property in SLH." WFTV spoke with another HOA attorney not related to the case. He said most likely individuals homeowners would not be responsible for legal feels, only the association. My experience with HOA attorneys and this particular matter resulted in numerous similar statements. Because of the complexity of the case, most lawyers looked at the most simplistic aspects of the case: "Man upset with HOA. Man sues HOA. Man sues members of HOA." Based on the basic information presented, of course the lawyer would believe the homeowners will most likely not be responsible for any legal fees. 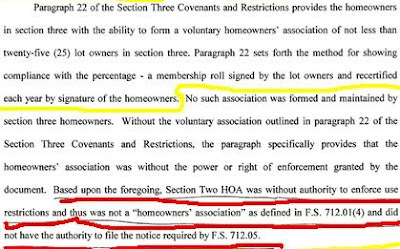 As a reminder, remember that the judge ruled the HOA was indeed not the ruling HOA - the association even admitted in court that it is not a HOA, but a corporation. Why would a person signing a consent form to allow a corporation rights over another person's property be free from any consequences? Basically, this report operated under the assumptions that led to this three-year-old court case (they did the same thing a couple years ago when they first reported on the lawsuit). Without proper research of facts, the author of this article, like resident Rarden, believed it was a dispute over a hundred dollar annual due and that the legality of the organization was in question, but as the courts have ruled - Sand Lake Hills has no HOA. Interesting comment. I suppose you did not read the article. As ruled by a judge, the "good HOA" was not a HOA and ran afoul of the law. Their actions put the entire community in jeopardy. Not to mention that despite the lack of a HOA since they have been struck down in court property values have still risen and the community looks as good as ever, if not better. Probably because new homeowners aren't scared away by the liability that was that "good HOA." If you want to see where such a situation was heading, you should check out Lime Tree Village Community Club Association, Inc. Converted in a similar fashion by Larsen and Associates, and like Sand Lake Hills, they are running rampant, except there was no big court case to stop them in their tracks. What did you find so good about Sand Lake Hills Section 3? Did you live in Section 3? The unfortunate part of not having an HOA is the amount of unkempt properties. I don't disagree with Busch at all on his frustrations, I have dealt with people who are on the board of an HOA and almost all of them let the power go to their heads and ruin the experience of living in a neighborhood for everyone. I would like to hear Busch's thoughts on solving the problem of the homes who refuse to maintain the outward appearance of their homes. It really is an eyesore across the neighborhood. There already is a regulatory body for that - code enforcement. Grass too high? Damage to a structure? Debris everywhere? They step in. For instance, in Sand Lake Hills, they had no architectural control but they granted themselves that authority and then demanded a homeowner replace a brand new roof because they did not like the appearance. In Lime Tree Village, they made up rules all the time and even when the covenants and restrictions expired they still pursued homeowners, and in one instance foreclosed on a property owner while knowing they had no legal authority to do so. They even admitted years later they had no legal authority. The bigger problem is there is no oversight for these quasi-governments. Not to mention that there are no protections for a homeowner when fighting so a HOA has hundreds if not thousands of people they can draw assessments from and fight. A homeowner does not have those resources. This is why most attorneys that specialize in HOAs work for associations. That is where the money is.